90 of the best Back to School Lunchbox Ideas for Kids including a Free Printable Worksheet to help you create fun and easy to assemble lunches all year long! It’s Back to School time at our house and that means I’m focused on getting organized for Back to School and coming up with a simple plan to make it through our mornings which includes having a plan for packing lunchboxes! Last year I made a giant list of Back to School Lunchbox Ideas at the beginning of the year and when I started to feel like I was in a rut I would pull out the list and add a few different items to my shopping list so that I would have some different things to pull from. This year I’ve put the entire list of 90 items in a FREE Printable Download You Can Grab Just Download This File Here and print it out to keep on your fridge for when you need some fresh ideas! I have found that including school lunches in my Menu Plan is a great way to help me stay organized. Each week when I sit down to make my weekly meal plan (Typically on Saturday Nights, before I shop on Sundays) I will check the school lunch schedule and write down any days that my kids will want to eat at school, then I plan out a meal to pack in the remaining days lunches. By planning this ahead of time I don’t have to think about it the morning of, and I can prep and prepare as much as possible on the weekend or on Sunday Nights after I’ve been shopping for the week. 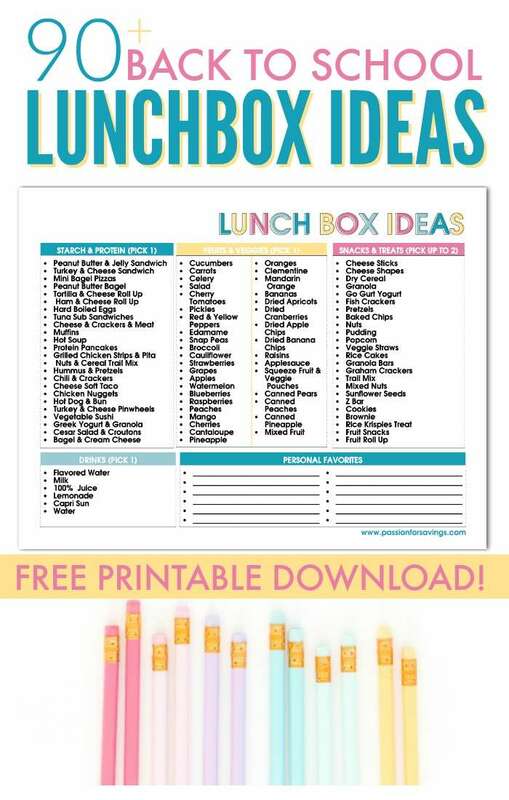 Click here to Download Your FREE Printable Back to School Lunchbox Ideas Worksheet when you sign up for our Back to School Email Updates! You’ll get hot deals every day for Back to School + A Free Printable for your Fridge to help you get Organized this year for Back to School! You can also set out Stations with snacks in them and signs on the front and let your kids build their own lunches. Let them pick one item from each category and they will have a healthy & balanced lunch each day! I am a homeschooling mum of 2, but I must say that the idea o pre-packed lunch boxes even for us homeschoolers would save my sanity. I will definitely download this for further perusal. Thank you!